This is a nice book if you want to learn the basics of Chinese calligraphy. The book is smart, but not so scholarly that it becomes hard to understand without already having a PhD in the field (a lot of books on this subject suffer from this affliction). Included are many charts detailing chronology of Chinese character development over thousands of years, and many visual examples of different character and writing styles. You'll also learn many stories about the ancient people that influenced the written language in Asia. I found the description of how xuan paper (rice paper) is made to be interesting - it made me want to try to make my own. 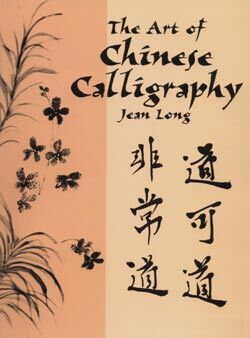 The last quarter of the book provides details on various materials that you will need to do your own Chinese calligraphy, and techniques that you will need to know if you wish to pursue creating your own calligraphy. Even if you have no aspirations to become a Chinese calligrapher, the information is none the less interesting. This book costs about $10 on Amazon. With 128 pages, you'll learn a lot, but not invest a huge amount of time into the effort. All illustrations are black and white. Some are better than others, and instead of typesetting characters used in the text for clarification, they appear to be hand-written. It doesn't hurt the real content of the book, but it does give the appearance of being a self-published book. If you are learning Chinese, and want to start doing your own Chinese calligraphy, this book is great, but all pronunciation guides (Romanized Chinese) are done using the Wade-Giles method (the type used only in Taiwan) instead of Hanyu-Pinyin (the type used in Mainland China, and most commonly used for people learning Mandarin Chinese). I had to take a best guess when I came across some new words. Many Chinese paintings contain a piece of calligraphy as an integral part of the composition. The poetry of prose is an essential component vital to the overall concept of an artist's design. There are two classes of calligraphic inscriptions which appear on painting compositions as diverse as landscapes, flowers, fish, and fruit. The first class is that written personally by the artist. It may be a poem envoking, in words, the story or mood already told by the brush, with the calligraphy harmonizing in style with the strokes of the painting. Alternatively, the artist's inscription may be an explanatory piece of prose adding deeper meaning to the painted subject. It is often not possible for the artist to convey the story behind the picture, or the reasoned inspiration which provoked it, without resort to words. The circumstances under which the painting was produced are often seen as important by the painter, since they help to make the painting less enigmatic. Quite often painted in humble surroundings, or after drinking too much wine, the poetry or prose integral to the painting gives insight into the painter's mind. Of course, the inscription could also be a straightforward dedication by the painter to the patron of friend for whom the picture was conceived. Finally, the variety of meanings inherent in the Chinese language allow inscriptions to be included in a painting, which can be read either as a straightforward comment, or as a veiled political allusion. This is an except of The Art of Chinese Calligraphy by Jean Long used in conjunction with this book review.